From Sept. 26 through October 2, 2016, Dr. Morgan’s paintings will be on display at the Ross House in Pikeville, TN, in conjunction with the annual Fall Festival in Pikeville. Please stop by the Ross House and take a look during the Fall Festival! His paintings will all be priced at only $50, and all proceeds will benefit Bledsoe County Schools, The Bledsoe Historical and Genealogical Society, The Ross House, and Mountain Education Foundation. In addition, the Ross House has been kind enough to allow Dr. Morgan’s paintings to remain at the Ross House after the show! Welcome to Dr. Rufus Morgan’s new website, showcasing his unique landscape paintings! We hope you enjoy looking at them as much as Dr. Morgan enjoyed painting them. Each one was painted from the heart. 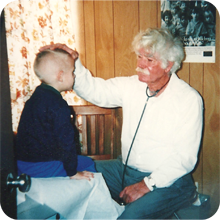 Dr. Morgan spent his working life in the incredibly beautiful Sequatchie Valley, driving over his beloved mountain roads, going on house calls, hunting, fishing, and searching for ancient Native American artifacts in the plowed fields of the valley. No one could have loved this area more than he did, and this love of a particular place pervades his work. Dr. Morgan taught himself to paint in his spare time, after a few lessons from a lady in Florence, Italy during WWII. After his retirement in the 90’s, he spent almost all his time in his studio at home, painting one canvas after another, or driving through the countryside taking photos. His style evolved over many years, from simple beginnings to more realistic renderings, then through various stages of more colorful expressionistic style. He worked on many paintings at once, glazing color over paintings he had started before, and often combined elements from several photos to create unique landscapes that had more to do with memories of the valley than any particular image. The result has been an incredible legacy reflecting his deep love of nature, the mountains, and his friends who shared his life there. 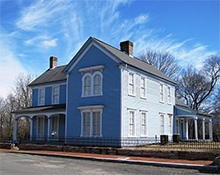 Dr. Morgan's paintings are now located (and available for sale) at The Ross House in Pikeville, TN. Please feel free to stop by to view them, or view online and inquire. 100% of all sales go to help the Mountain Education Foundation, Bledsoe County Schools, The Bledsoe Historical and Genealogical Society and The Ross House.